Pepper Spray for the Soul: Primitive art not so primitive after all? 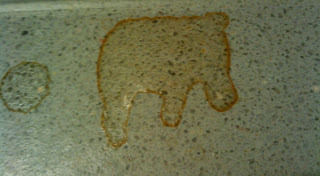 I found an "office cave painting" the other day: a coffee splotch on a counter that looked like a hippo. Note the sophisticated use of foreshortening that makes this young hippo seem to be walking away from us.